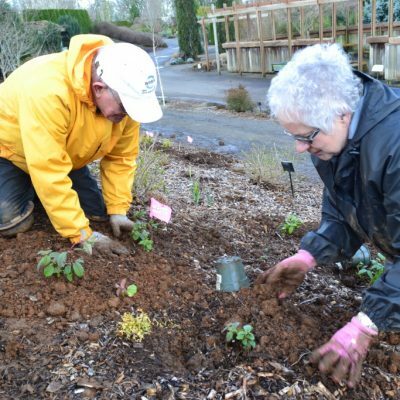 Join our team and enjoy the many benefits of volunteering at The Oregon Garden. This is a great way to meet new people, learn more about gardening and plant care and share your skills with the many visitors coming to The Oregon Garden. Volunteer as an individual, with a friend or bring a group to share in the fun. Volunteers must be at least 16 years old for most positions. We are looking for volunteers who can commit to at least one 4 hour shift per month. Seasonal and short term opportunities are available with our Visitor Services and Horticulture departments. We also need volunteers to help with our Special Events – if you can’t commit to once per month, check out our Events to see if any of the dates work with your schedule. Step 1: Submit a General Volunteer Application, Student (under 18 years) Volunteer Application, Group Volunteer Application, or Special Event Volunteer Application. Horticulture: Available year-round, peak May – October. Positions open Monday – Friday, some Saturday availability. Visitor Services: Positions open daily, May-October, and Saturday/Sunday during the off-season. Education: Available year-round at special educational events. Special Events: Available year-round depending on event schedule; Peak April – October. Positions open Saturdays (usually); occasional weekday evenings. Administration: No positions currently open. Have fun, meet new people and learn more about gardening. Help your community to have a great, peaceful place to learn, reflect and enjoy the beauty of the Garden. Volunteer name badge and shirt. Volunteer meetings and training to ensure you have the best volunteer experience possible. A variety of discounts and other benefits (minimum of 25 volunteer hours per year).